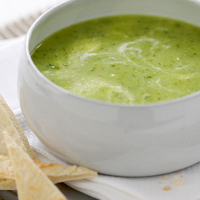 This wonderful spring soup is substantial enough to serve as a meal in itself. And, if the weather suddenly heats up, why not enjoy it chilled. In a pan, blend the cornflour to a smooth paste with a little of the vegetable stock, then pour in the rest. Stir in the diced potato, onion and garlic and bring to the boil. Simmer uncovered for 15 minutes. Add the grated courgette and cook for a further 5-8 minutes. Remove from the heat and stir in the mint leaves. Using a hand-held blender, whizz until smooth. Season to taste then ripple the yogurt through. Ladle into bowls and serve with lightly toasted pitta fingers. If serving chilled, leave to cool before adding the mint leaves and whizzing until smooth. You can substitute other floury varieties of potatoes such as King Edward instead of the Maris Piper potatoes. This recipe was first published in April 2008.